Do Apps That Cut Blue Light Help You Sleep? 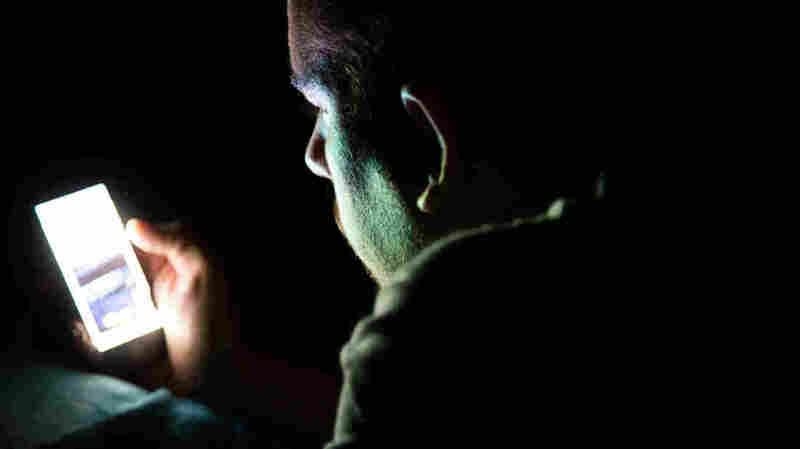 : Shots - Health News Lots of phone and tablet apps promise to improve sleep by filtering out the blue light from device screens. But that won't help if the reason you're not getting enough shut-eye is caffeine or stress. My first call is to Lisa Ostrin, an assistant professor at the University of Houston College of Optometry. Ostrin owns an iPhone. And every iPhone comes with an app called Night Shift that lets you filter out blue light. So does Ostrin use Night Shift? "Yes I do," she tells me. Without a filtering app, cellphones and tablets expose users to an alarming amount of blue light, she says, "Especially as people are lying in bed and have their screens just a few inches from their face." And all that blue light prevents special photoreceptor cells in the eye from triggering the release of a sleep hormone, she says. "Normally when the sun goes down and the lights turn off, our body releases melatonin, which helps us get a nice restful sleep," Ostrin says. "But when we have all this artificial light on, it's tricking those photoreceptors into thinking it's still daytime." Ostrin was part of a team that showed this in a study published this summer in the journal Ophthalmic & Physiological Optics. In the study, 21 people put on special glasses after sunset each day to filter out blue light. "So essentially we blocked the input to those photoreceptors that tell our body it's still daytime," she says. After two weeks, the participants' melatonin levels had increased by 58 percent. And they reported better sleep. Apps that filter the light from device screens are less effective than blue-blocking glasses, Ostrin says, but still can help. "I highly recommend them," she says. To get a different perspective, I call Brian Zoltowski at Southern Methodist University in Dallas. Like Ostrin, Zoltowski studies blue light and sleep. And he also owns an iPhone. But "I am not a Night Shift user currently," he says. Zoltowski used to use the app. He also found ways to reduce the blue light coming from all of his other screens during the evening. The downside was that everything he saw in the evening was some shade of orange. And he wasn't sure he was sleeping any better. "So I'm looking at an orange screen watching a video realizing I'm also drinking a cup of coffee," Zoltowski says. "And it started to make me wonder then why I'm actually trying to decrease the amount of blue light when the caffeine that I'm drinking in my cup of coffee is probably having a larger effect on my sleep quality." He also realized he just didn't like looking at all those orange screens. So he turned off Night Shift and all the other blue light filters on his devices. "I'm willing to take the blue light exposure for the improved quality of the images," he says. Zoltowski says people need to remember that devices are just one source of blue light. Others include indoor lighting, streetlights and car headlights. So he says a filtering app may not be worth it, especially if you're already getting a good night's sleep, he says. "But if you suffer from sleep problems and you've tried other things like eliminating caffeine later in the day," he says, "this is something you can add to your repertoire to promote a healthful sleeping environment." If you're serious about getting better sleep, though, you might want to avoid screens entirely near bedtime, Zoltowski says. "Try to wind down, shut down your devices, dim the lights, relax and maybe read a book the old fashioned way." At least one study found that people took longer to fall asleep when they read from a light-emitting e-book than when they read from a printed book.